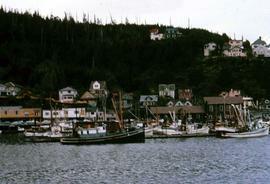 Colour Kodachrome 35mm slide depicts the harbour of Juneau, Alaska.Note: Brightness adjusted on JPEG. Film depicts a baseball game, various shots of city scenes, men golfing, people panning for gold, and scenes of what appears to be the Yukon. Phyliss Snider is in some of the footage. Colour Kodachrome 35mm slide depicts the Red Dog Saloon in Juneau, Alaska.Note: Brightness adjusted on JPEG. Colour print depicts an unknown woman, likely the bartender, behind a bar. On the back of the image is written: Hotel Bar in Juneau. On the bottom right corner is the date stamp. Colour Kodachrome 35mm slide depicts a view of Juneau, Alaska.Note: Brightness adjusted on JPEG. Film depicts various city and scenery shots of what appears to be the Yukon. Phyliss Snider is visible in much of the footage.